In Danger in the Stars by Veronica Scott, Miriell is an empathetic priestess who has been captured and enslaved by an evil corporation for use to their advantage. When her services are rented to Lady Opherra, Miriell meets Conor and his energy fascinates her. Conor has secrets that Miriell could use against him if she got too close. Can he resist Miriell and keep them both alive? And can Miriell escape and save her people without being blown up in the process? 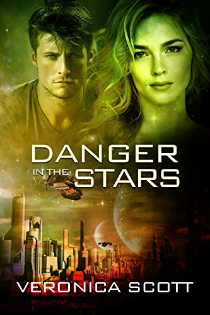 Danger in the Stars is a novel from the Sector series. Followers of this blog will know that Veronica Scott is one of this reader’s favorite authors. Scott’s world-building is flawless and while each work stands alone, reading the series in order both enhances the experience and shows the progression of the author in her expansion of the Universe. In Danger in the Stars, she continues her trend of world-building giving us a closer look into the world of the overall series baddie, the Mawreg. It’s no mistake that Scott recaps the show “Dark Matter” as both her characters and their world are unique but in the spirit of that inventive sci-fi series. Be sure to check out Scott’s interview with Anthony Lemke who plays Three on the show. That character’s archetype seems to be the sort of man that this author loves to write. They share a clever strategy behind a brash persona. Conor would fit right in with Three. He’s basically acted and bluffed his way into a power position in a vicious corporation with a brutal woman who, frankly, is an exceptional antagonist. Lady Opherra doesn’t feel as though she needs or wants Miriell mucking up the works in her day to day business but is smart enough not to defy the boss until she’s ready to take that position … and she is ambitious but smart. What I love about Lady Opherra is that she’s smart without falling into the trap of becoming catty. In keeping with the theme of strong women, Miriell has no lack of spirit. As an empath, she’s able to read people and seems to have a firm hold on reality, but she’s one to weigh her options and run the odds before acting. She does not hesitate to act when the time comes, which makes her just really fun to read. Let’s be clear, she’s in a horrible situation. She’s a slave with an exploding collar keeping her in check and a handler that views her in the same way that he might a trained parrot. Miriell is a novelty for him to parade around and an outlet for his cruelty. There is a social commentary in their dynamic very reminiscent of what one might see in historical movies. There are always good people but there are always those who, given the chance and a lack of social scrutiny, would act to break spirits and subjugate people for their own entertainment. Balancing the bad in the world is good. Conor is a cagy strategist but a strong and clear soul. Miriell, as an empath, sees that immediately and feels as though when it matters, he will be someone that will keep people in dire circumstances safe. As usual, Danger in the Stars is well crafted and well written. Conor and Miriell are perhaps the most polished characters in all of her series, which is really saying something because Scott is a best-selling author with a great gift for layering her characters, no matter how small the role. The duo faces a fair amount of danger and choices that are gambles and are simply a delight to read. If you want to read reviews about Veronica Scott’s other books, be sure check the Sector series and the God of Egypt series here. Something to add to my reading list!